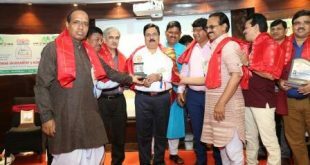 Bhubaneswar: National Aluminium Company Limited (NALCO) on Sunday celebrated Utkal Dibasa with gaiety and fervour at Nalconagar, Bhubaneswar. To mark the occasion, the company celebrated the day with a function at Bhubaneswar, which reflected a distinct spirit of Odisha. While addressing the gathering, NALCO CMD Tapan Kumar Chand lauded Mines and Refinery Team for achieving 100% capacity utilization in Mines and Refinery. 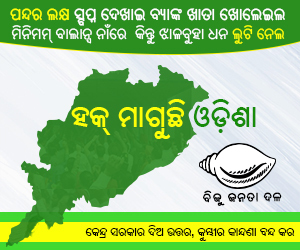 “Starting of new Mines-South Block Panchpatmali is a bold step. 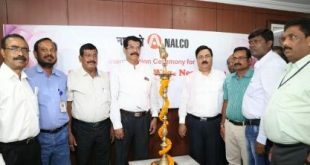 After being credited for the lowest cost producer of alumina in the world, NALCO has done Odisha and the country proud again by clocking the highest ever bauxite excavation of 70.84 lakh tonnes since inception and also the Refinery team has done a commendable job by producing 21.11 lakh tonnes, which is also the highest ever since inception,” said Chand. NALCO has ended the financial year 2017-18 on a strong note with smelter collective producing cast metal of 4.25 lakh tonne, registering a growth of 9.8%. The total sales of the company also registered sharp growth with sales of 4.26 lakh tonne and 42 alumina shipment exports, enabling the company to achieve the highest turnover ever since inception. “My compliments to finance and production teams for settling water dispute with the state government. 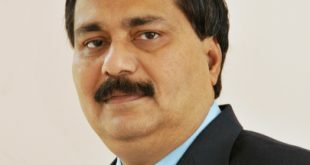 The project team has achieved the distinction of getting lease transfer for Utkal-D land and environment clearance for Caustic Soda Plant in Dahej, Gujarat,’’ Chand added. During the programme, Dr Tapan Kumar Chand felicitated two promising sportspersons of Odisha-Aparajita Gochhikar, Chess player and Geeta Bhuyan, Baseball and softball player.